Looking west across the prairie near McAllaster Butte in Logan County, Kansas. 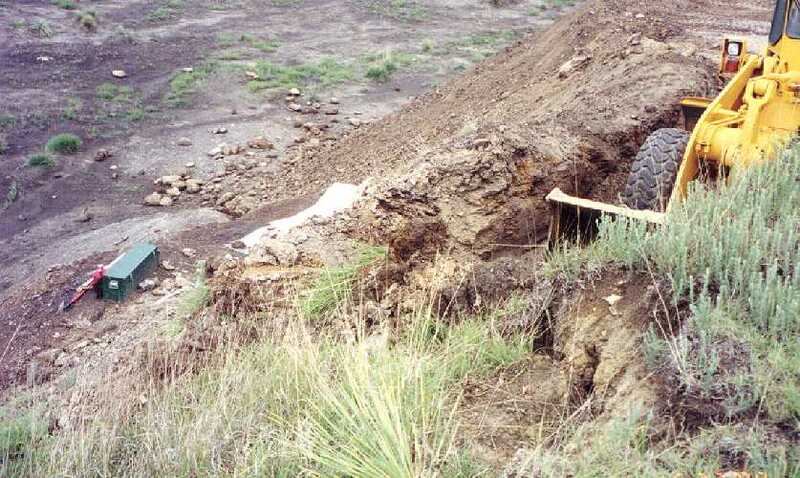 The dig site is in a large gully, just right of center, below the truck. We will probably never know why or how the plesiosaur died 80 million years ago. After death, its body may have sunk to the bottom of the Western Interior Seaway for a short time. Then, as it decomposed, gases were trapped inside the abdomen. Bloated by these gases, the plesiosaur was lifted back to the surface where it probably floated for several days. Weighing several thousand pounds, the large carcass would have attracted sharks who scavenged at the paddles and other exposed flesh, but did little major damage. In the warm water, however, the relentless efforts of bacteria and other micro-organisms swiftly destroyed the muscles and ligaments that held the plesiosaur together. At some point, the abdominal wall ruptured, releasing the trapped gases and the heavy body sank quickly to the mud bottom. spilling ribs and gastroliths along the way. The impact was violent enough to tear apart the skeleton even further, and to scatter some of the rib cage and other bones across the sea floor. Small scavengers fed on the remaining flesh for some time. 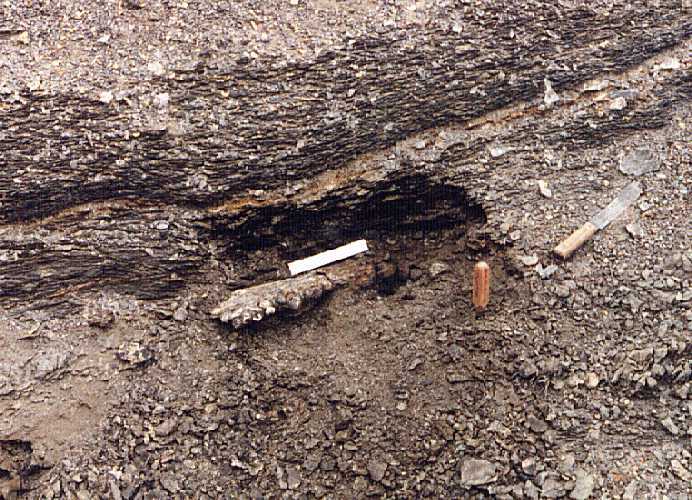 The bones were slowly covered by fine sediments and were eventually buried under hundreds of feet of shale. Millions of years later, the sea became shallower and then disappeared all together as the land was lifted upward. The hundreds of feet of rock that had buried the bones was slowly eroded away and the bones were finally exposed to the light of day. ..... Of course, this is fiction..... we really don't know what happened. 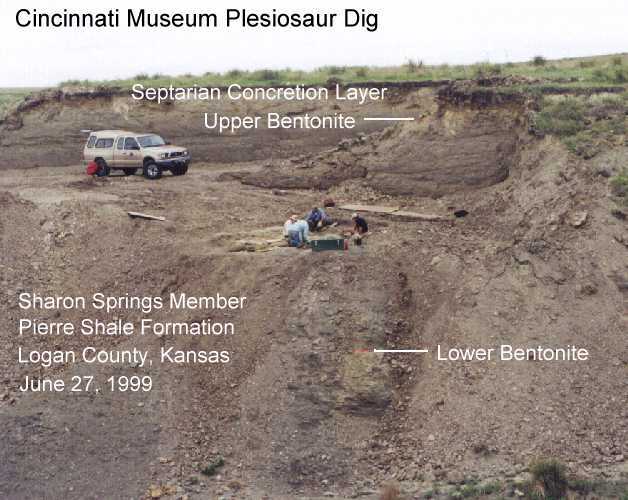 The dig on this plesiosaur actually started four years ago in the spring of 1995 with the discovery of an articulated series of plesiosaur caudal vertebrae eroding from the side of a steep slope in the Sharon Springs Member of the Pierre Shale in Logan County, Kansas. 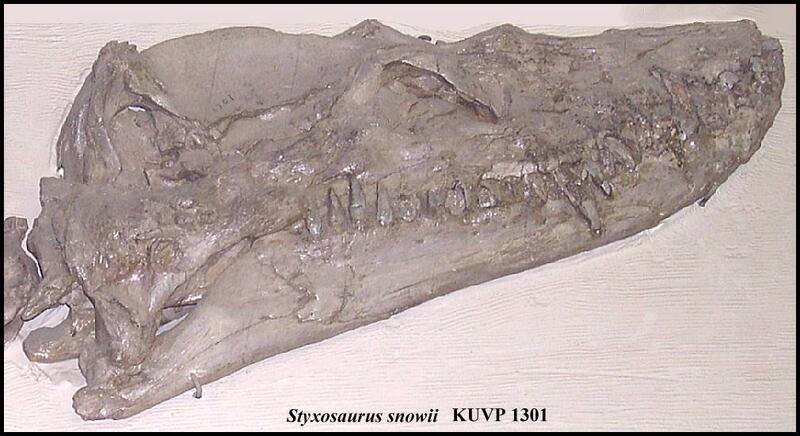 This plesiosaur was found by a young girl (Katie Swann) on a school field trip led by our friend, Pete Bussen. 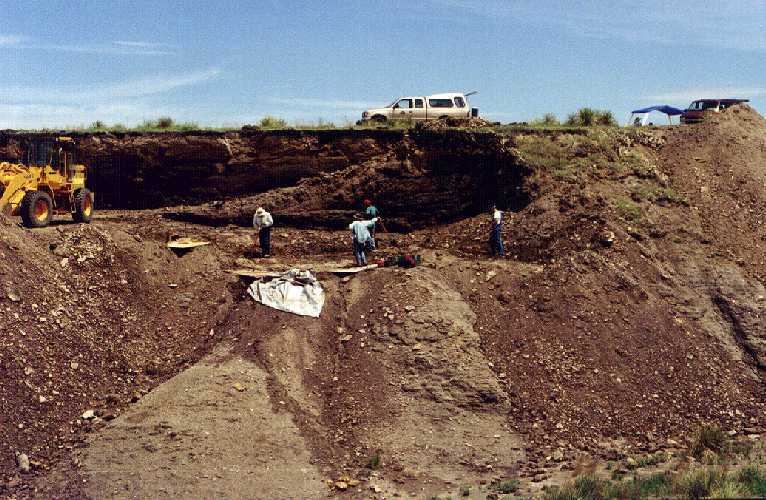 Other remains that have been found at this site include a Platecarpus mosasaur, the only Globidens remains (a shell crushing mosasaur) ever found in Kansas, a concretion full of Baculites maclearni [mclearni*], and other fragmentary remains of marine reptiles and fish. 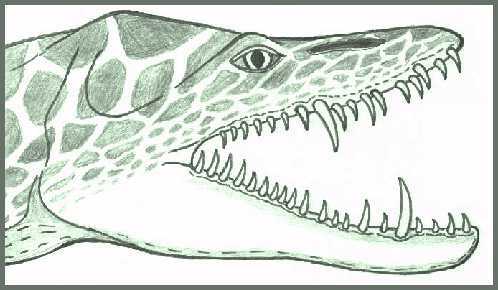 More info on the Globidens can be found here; pictures of the Platecarpus skull can be found on the Platecarpus Collection page of the Virtual Mosasaur Museum. 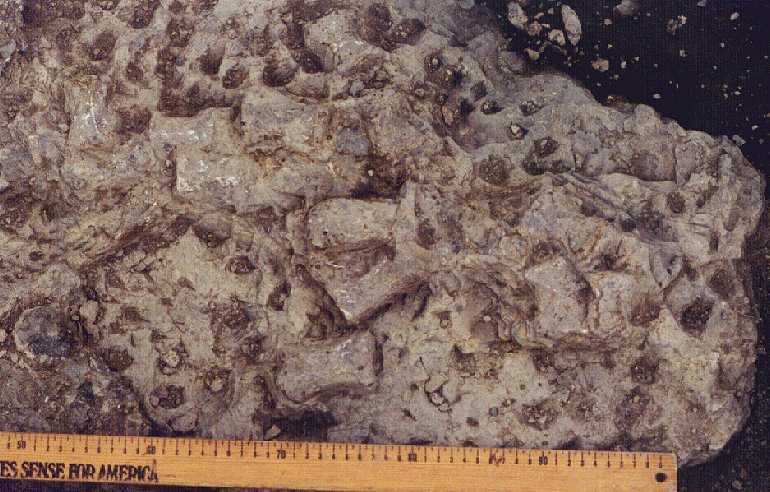 This is a 1995 picture of the caudal (tail) vertebrae of the plesiosaur which had eroded out from the edge of a concretion in the Pierre Shale on the steep side of a gully. Camera is facing to the east. A close up of several of the caudal vertebrae laying end to end and still articulated. Scale is one foot. 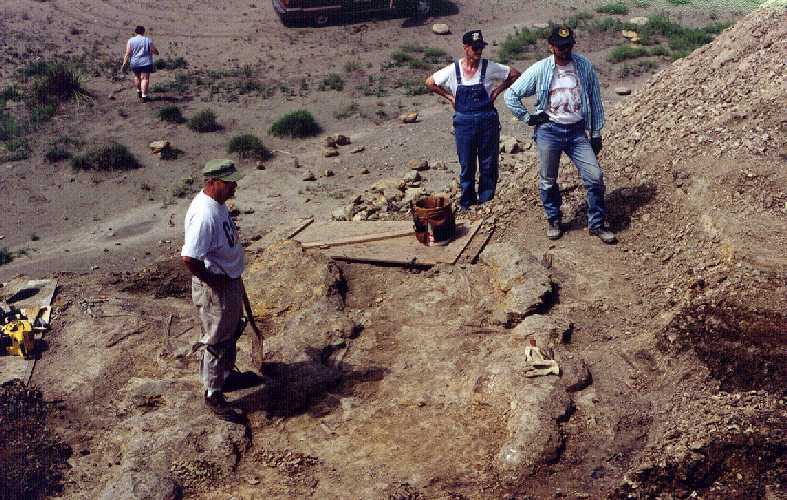 The discovery was made even more interesting by the fact that the first plesiosaur to be discovered in the United States (Elasmosaurus platyurus) was found by Dr. Theophilus H. Turner, just a mile to the south, near McAllaster Butte, more than a hundred and thirty years earlier (1867). Turner was an Army doctor stationed several miles to the southwest at Fort Wallace, at a time when the U.S. Army was protecting the workers who were building the first transcontinental railroad. The "rest of the story" on that particular specimen involved shipping it by rail to E. D. Cope, the famous paleontologist, in Philadelphia where it was quickly prepared and put on exhibit .....with the plesiosaur's head on the wrong end. Cope published several articles describing this strange animal and Copes mentor, John Leidy, was the first to point out the error. O. C. Marsh, Cope's rival, later claimed that he had mentioned the error to Cope, and said it was the reason that Cope hated him. This incident has been erroneously blamed for what became the 'Great Feud' between these two famous American paleontologists. However, the head was quickly moved to its rightful place and the incident was largely forgotten until Marsh raised the issue twenty years later (1890). The specimen has been in the collection of the Philadelphia Academy of Natural Sciences ever since. Pete identified the material as the remains of a plesiosaur and told the landowners what had been found. Then he called David Parris with the New Jersey State Museum to see if he was interested in digging the specimen. Dave, of course, was very interested because plesiosaur skeletons are not all that common (a friend of ours at the Denver Museum once said, half-seriously, that they were so rare that a paleontologist is only entitled to find one in a lifetime). By then, Pete had three or four to his credit. 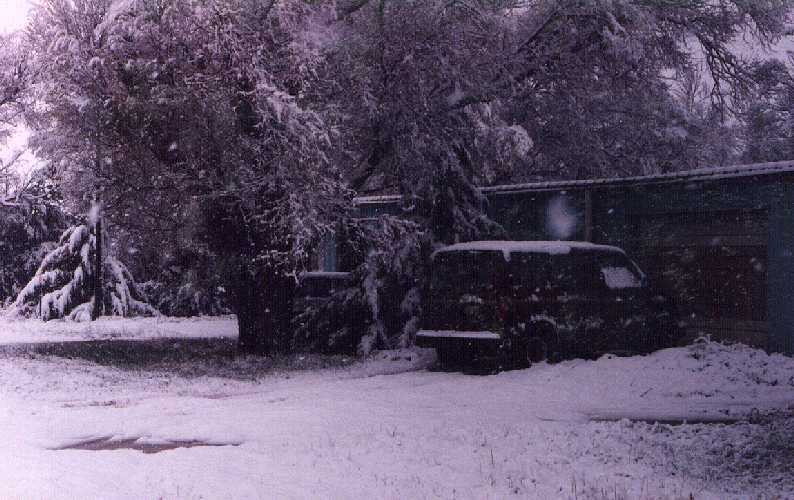 In April, Dave came back to Kansas to look at the site and was met with a freak snowstorm that dumped 6 or more inches of snow on the area in the space of a couple of hours. He managed to see enough, however, that he decided to arrange a dig, and the wheels were set in motion to work on the site in August of that year. 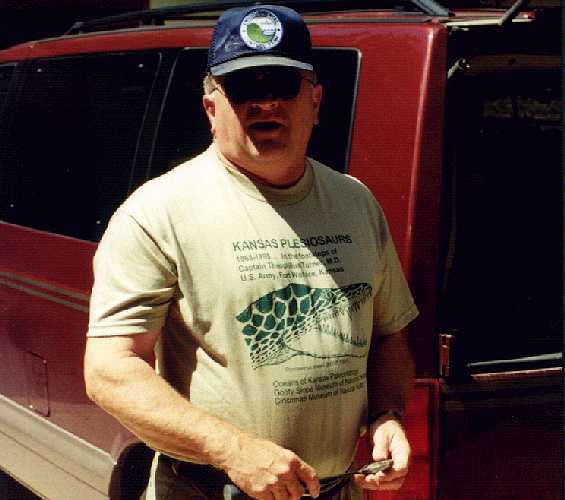 As is normal for Kansas in August, it was very hot and very dry when Dave Parris brought his field crew down from South Dakota. The remains were eroding from a steep, south-facing slope and the nearest tree was half a mile away. 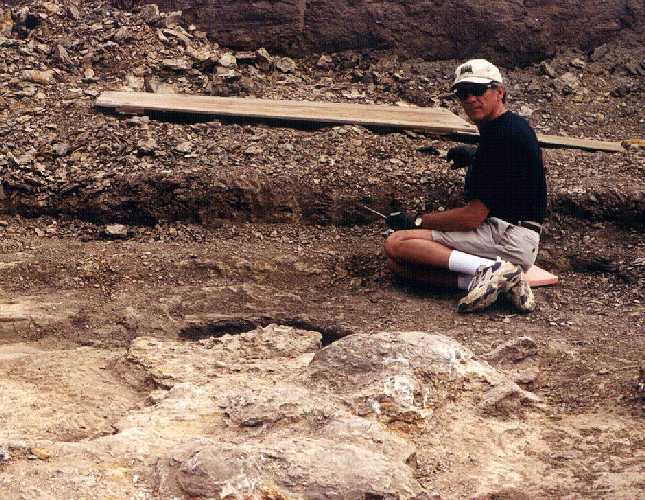 Aside from the small bench where the vertebrae and an associated concretion were exposed, there was no place to stand on the shaley slope. 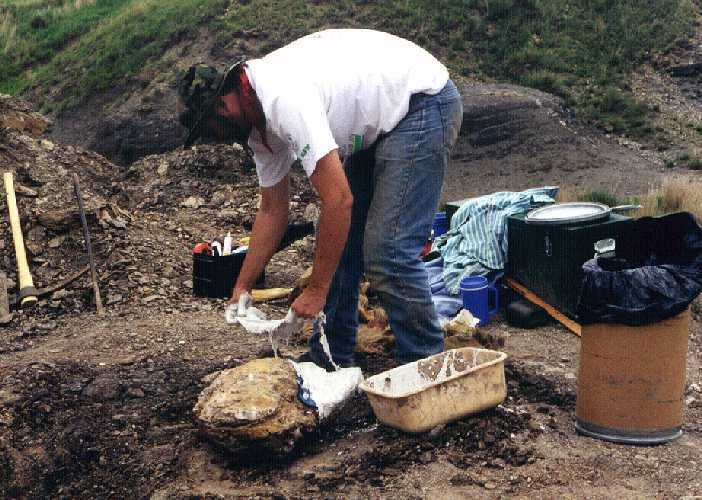 The first order of the day was to carefully remove the shale overburden from the top and either side of the concretion, and begin to determine the extent of the find. Almost immediately, jumble of short ribs (gastralia) and a few small stones (gastroliths) were found on the east side of the concretion. 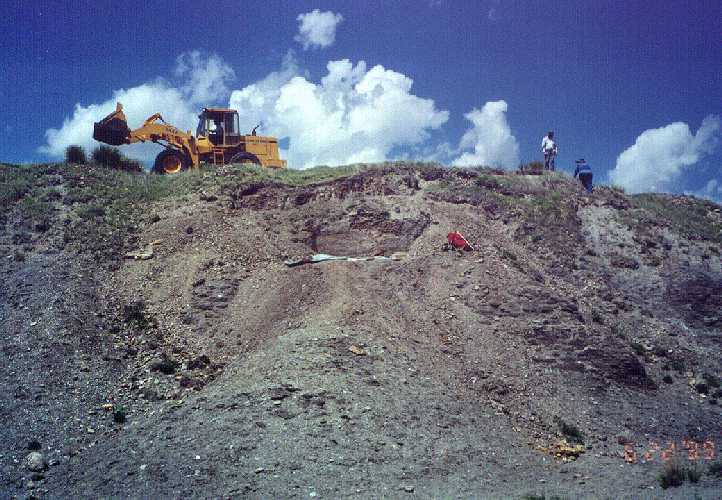 This provided an indication that there was more of the fossil inside the hill, and a preliminary idea that it was going to be somewhat disarticulated. 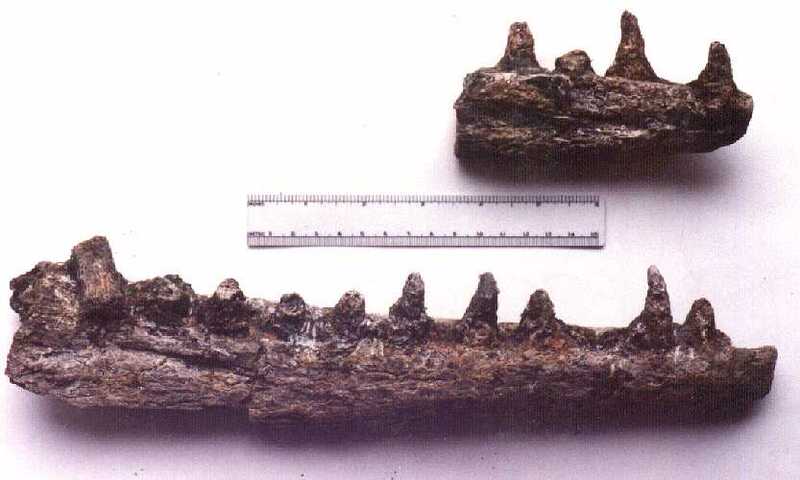 (The bones of the first plesiosaur that the New Jersey crew dug in 1991 were generally still articulated). The other concerns at this point were which way the animal was laying, how much might be there, and how much overburden was going to have to be removed to get to the remains. 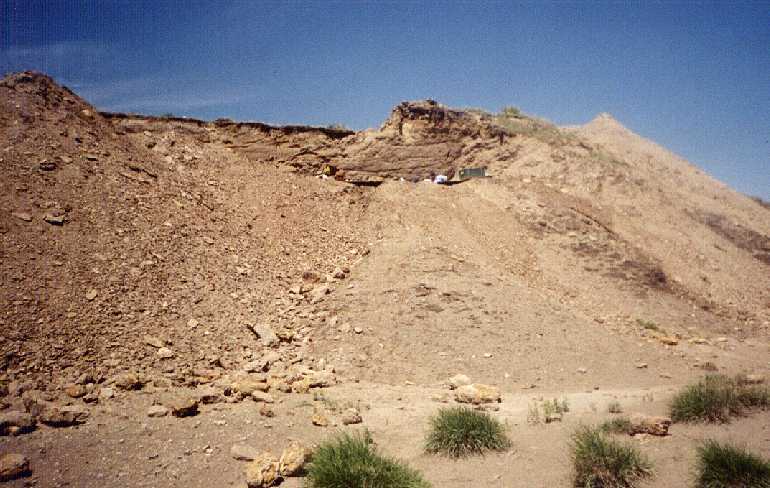 Since the shale sloped steeply upward about 12 feet above the fossil, any digging was going to require the removal of a lot of the overlying shale first. 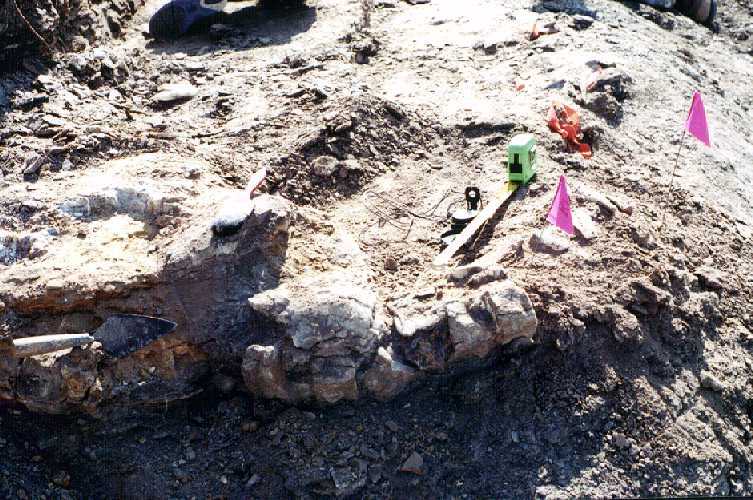 Once the overburden was cleared off the exposed concretion, work began on locating bones that were still in the shale. 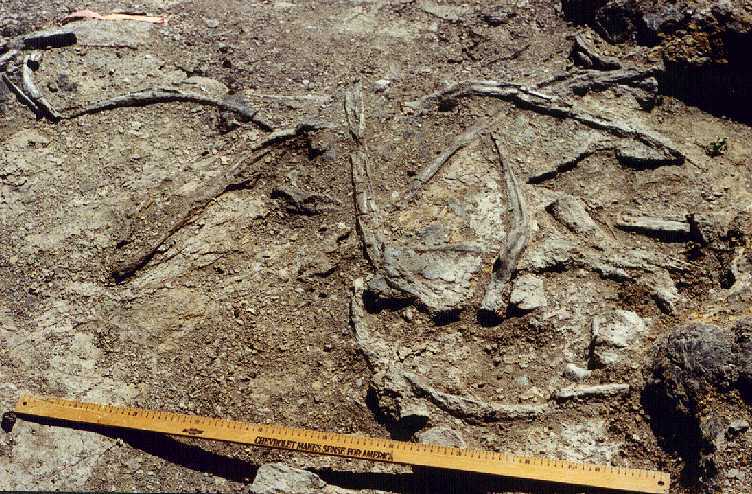 The first remains we found were lots of ribs from the belly of the plesiosaur. 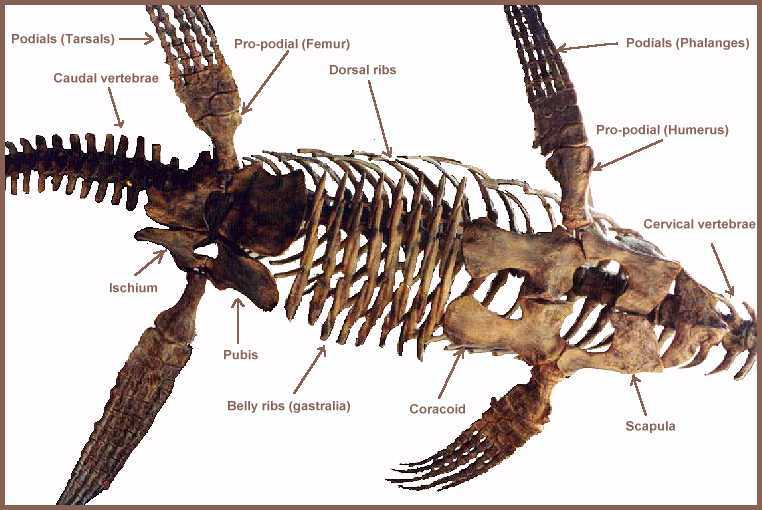 In addition to the normal dorsal ribs that come off of the vertebrae, plesiosaurs had three additional ribs (gastralia) that covered their belly. There were also three gastroliths and a fish vertebra found in this area. 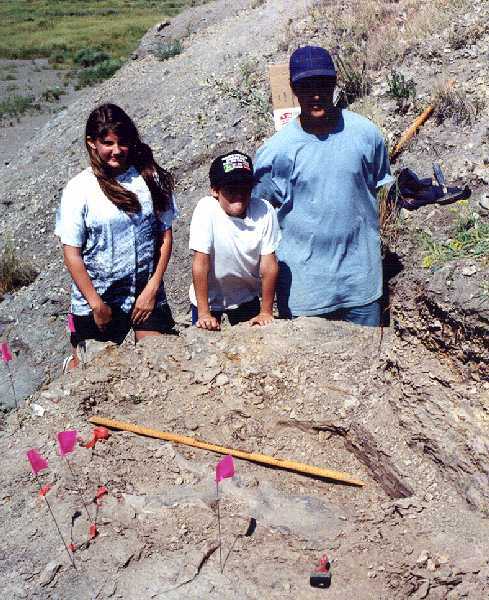 Katie (left) discovered this plesiosaur fossil on a school field trip in 1995, and came out for both the 1995 and 1999 digs. She is standing behind concretion #1, next to the spot where the caudal vertebrae were eroding out. 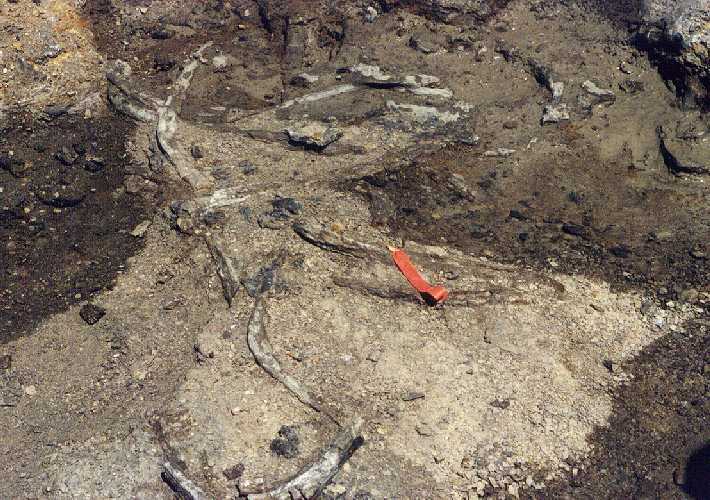 The partial pelvis of the plesiosaur is visible in the foreground. North is to the right. 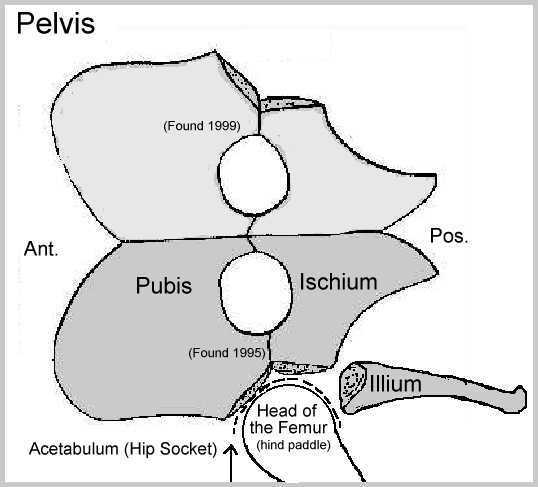 A picture of what is probably the right half of the pelvis of the plesiosaur. The smaller bone to the lower right is the ileum. Scale is one meter. Picture was taken while standing on top of concretion #1. North is to the left. 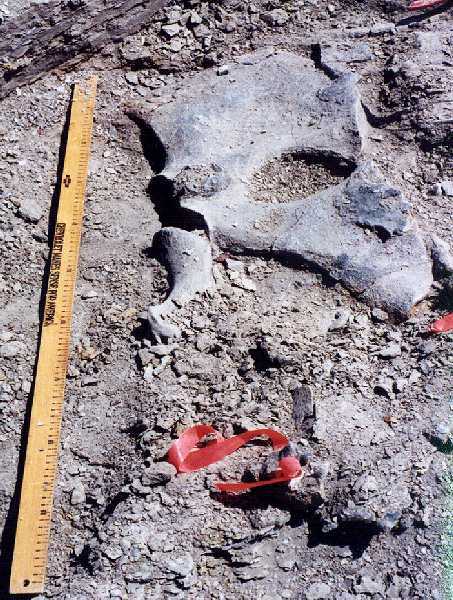 Another view of the partial pelvis. Scale is one meter. 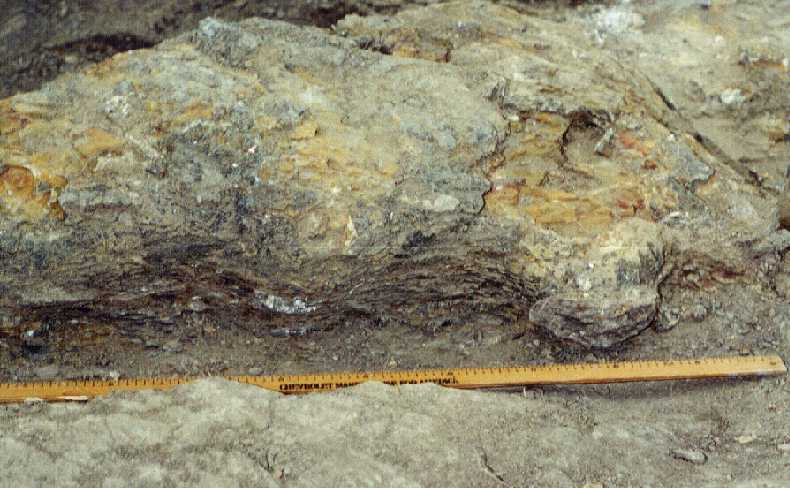 The other half was eventually found (1999) inside a nearby concretion. Time was short for the New Jersey crew since they had already been in the field for several weeks. A exploratory cut was made about 10 feet wide and 6 feet deep into the slope. More concretions and ribs were found. In mid-afternoon, a large piece of bone was found and general work slowed as it was uncovered. The bone turned out to be half of the plesiosaurs pelvis, laid flat and in excellent condition. Based on the shape, David tentatively identified the plesiosaur as an Alzadasaurus (now called Styxosaurus, see Carpenter, 1999, citation below). This useful bit of information assured us that we were working on a long-necked plesiosaur and not a short necked pliosaur (which are also found in this formation). 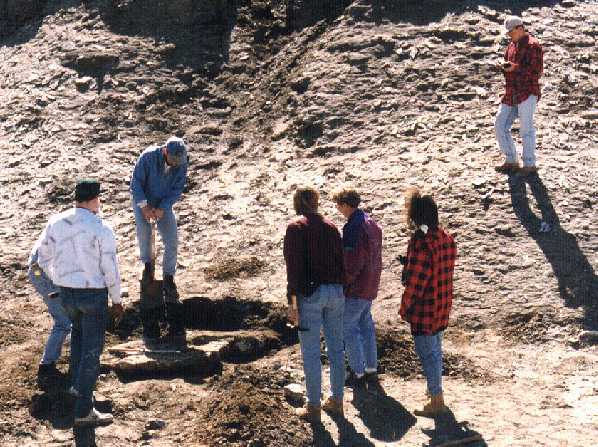 We had also cleared enough area by that time to give us a good idea that the remains were going into the hill and we had a good chance of recovering more of the animal. (The other possibility which we were afraid of was that the front end of the animal had eroded out years ago and we were simply finding the last few pieces of the skeleton). 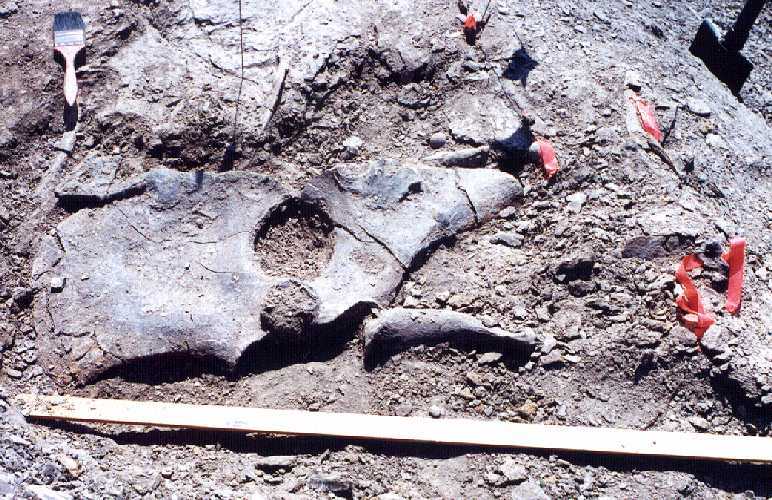 The next day, caudal vertebrae and the half pelvis were jacketed and removed along with several exposed bones. These included the dorsal spines of several caudal vertebrae from the end of the tail that had apparently eroded away and were already lost. Then the remaining material was covered and secured until the crew could return. 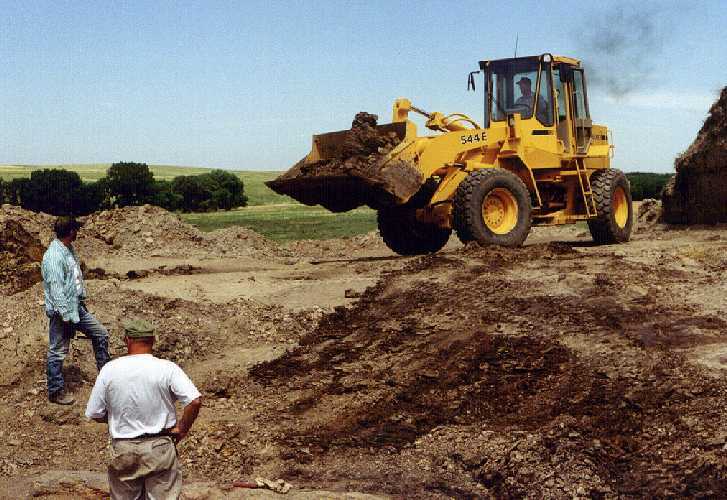 As it turned out, David was only able to return to the site one more time, in August of 1996. 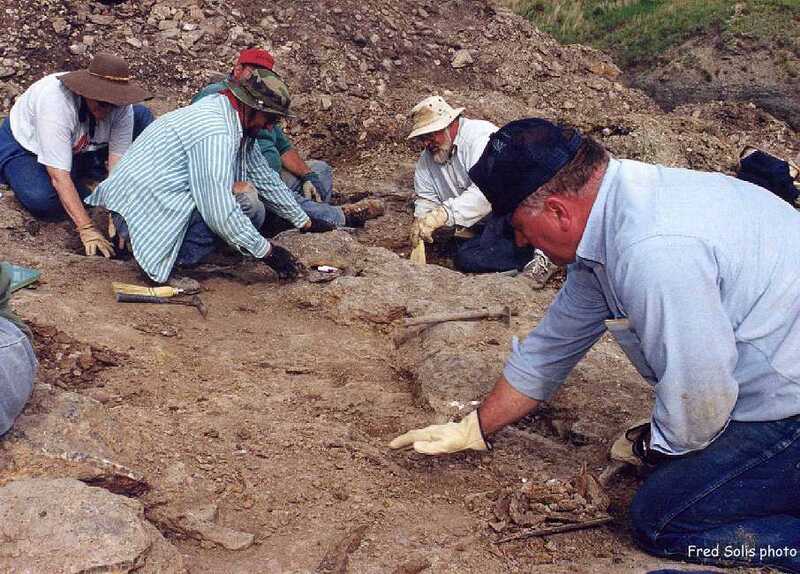 Shortly after that, the New Jersey State Museum was host to the highly successful "Russian Dinosaurs" exhibit and there just was not enough time for David to break loose and come back to Kansas to finish the dig. Having waited 80 million years to see the light of day, the bones of the plesiosaur would have to wait a few more. 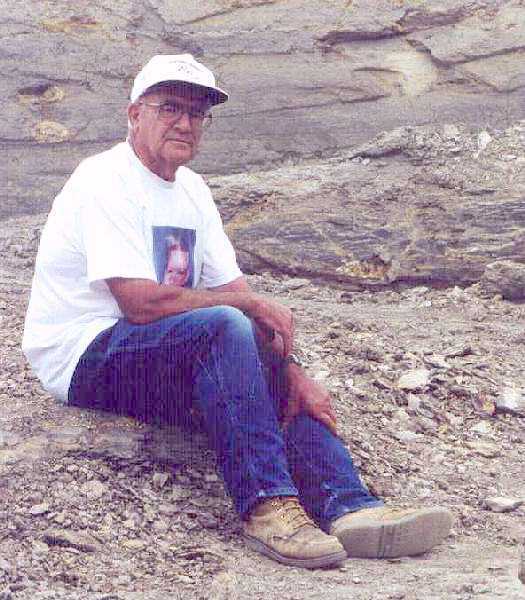 Later, when Pete Bussen arrived at their camp, the group kidded him that they had moved 30,000 cubic feet of dirt off the fossil that day. Pete, not knowing that they had received a lot of help, decided that they had been out in the sun far too long. That night, another volunteer, Richard Swigart, arrived all the way from Illinois to help with the dig. Day 3 (Wednesday) The landowner returned to finish the job with the high loader and the dig crew began to work on the remaining 12 to 18 inches of shale overburden above the fossil. 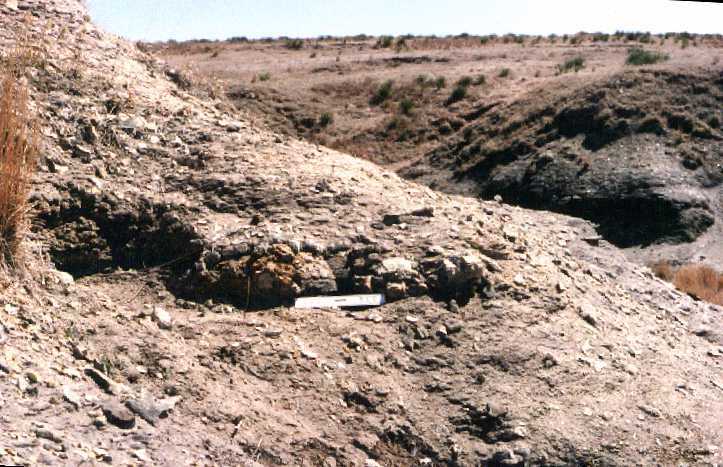 Soon there were two parallel lines of concretions exposed, heading generally to the north-northeast. The concretions on the east side seemed to be filled with bones while those on the west did not. 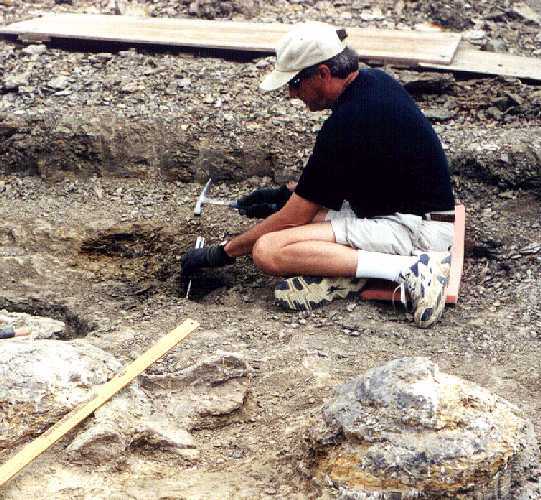 Glenn was happily locating and identifying various parts of the plesiosaur; limb bones, vertebrae, ribs, etc. From all appearances, the plesiosaur had been fairly complete when it hit the bottom. 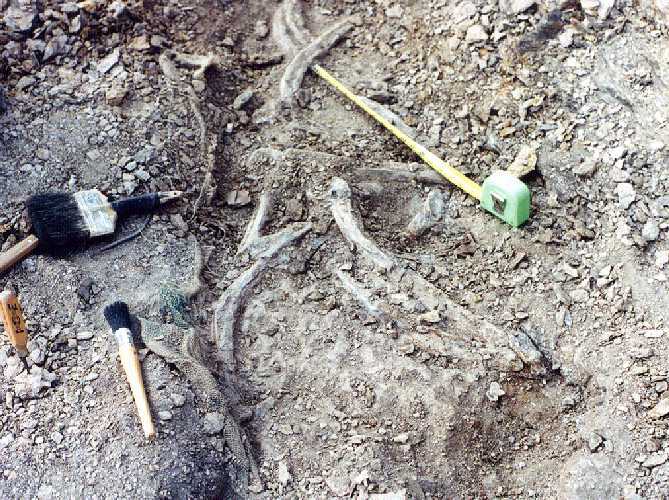 Most of the bones were located in the general areas where they were expected to be, but very few were articulated. The suspicion grew that this animal had bloated and floated for quiet some time, and was beginning to fall apart before it came to rest on the muddy bottom of the Western Interior Seaway. 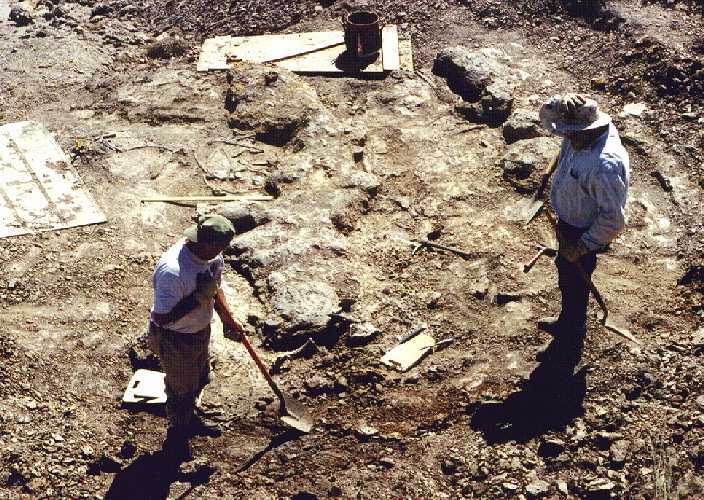 At the close of the day, the crew covered the site with a tarp to protect the exposed bones. "The Belly of the Beast" - This cropped picture of a large elasmosaur mounted overhead in the Denver Museum of Natural History provides a quick lesson in plesiosaur anatomy and shows the approximate extent of the skeletal material recovered during the June, 1999 dig. The interlocking gastralia provide a nearly solid shield of bone to protect the belly of the plesiosaur. Angie, another volunteer from Kansas, Pam and I arrived in Oakley, Kansas (about 30 miles from the dig) Wednesday evening. 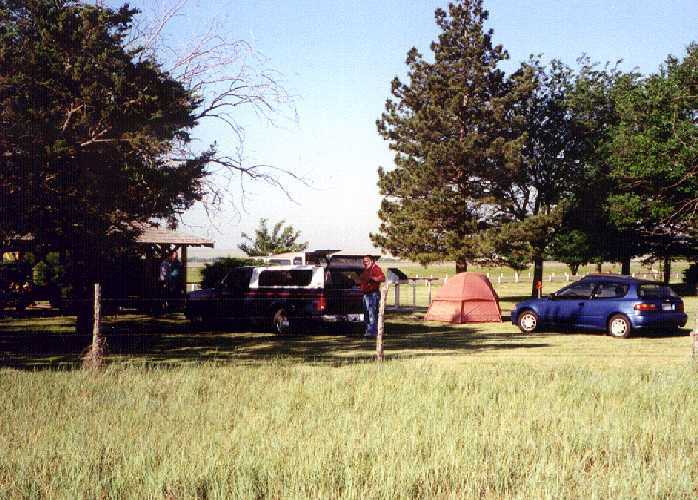 We were staying in a motel during our time on the dig and not roughing it like most of the rest of the crew. Years earlier, we had decided that its much easier to put up with the sun, the dirt and the aching muscles when you have a shower, air conditioning, and a comfortable bed waiting for you. That night, however, I was awakened several times by the sound made by strong wind gusts as a major storm front moved through. I was concerned about the people staying in tents, and what the rain was doing to the fossil, and to the dirt roads that we had to travel to get to the fossil the next morning. Day 4 (Thursday) When we got ready to leave that morning, the sky was still cloudy and a light rain was falling. Figuring that there was not much need to hurry, we got on the road to the dig shortly after 9:00 AM. About thirty minutes later, we pulled off the highway at McAllaster Buttes, and took a brief look at the dirt road leading to the site. It looked like a truck had mudded its way out to the highway a few minutes earlier, but no one had driven in since the rain. Then we drove into Wallace and the roadside park where everyone was camped. They were still cleaning up from breakfast when we arrived. After greetings and introductions were out of the way, we got to hear the various horror stories about how strong the wind was and how much water got into the tents. Pete Bussen was there, too, and said that the surrounding areas had gotten up to an inch and a half of rain. 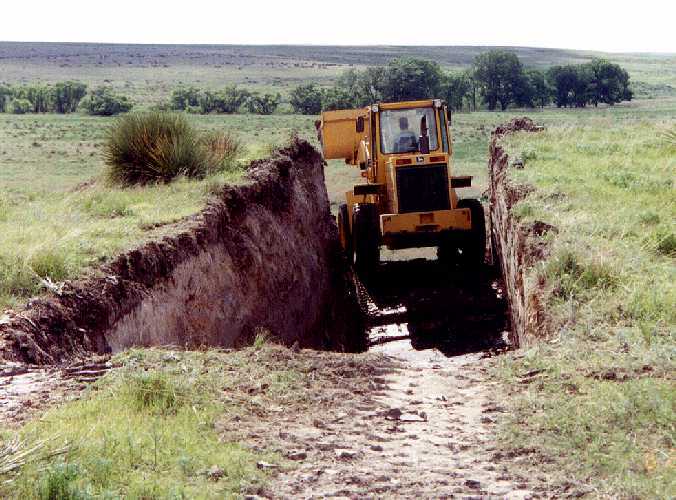 He was optimistic that the road and the shale would dry out quickly, and not prevent us from working at the site. After spending an hour or so in the camp, and the nearby Wallace Museum (a nice place to visit), we decided take a chance and see if we could get into the dig. We convoyed out to the turn-off and headed down the dirt road. The first quarter mile or so was still pretty slippery (as Pete had predicted) since it was built on a shale base, but once we started down the hill on the other side, the road dried out quickly. 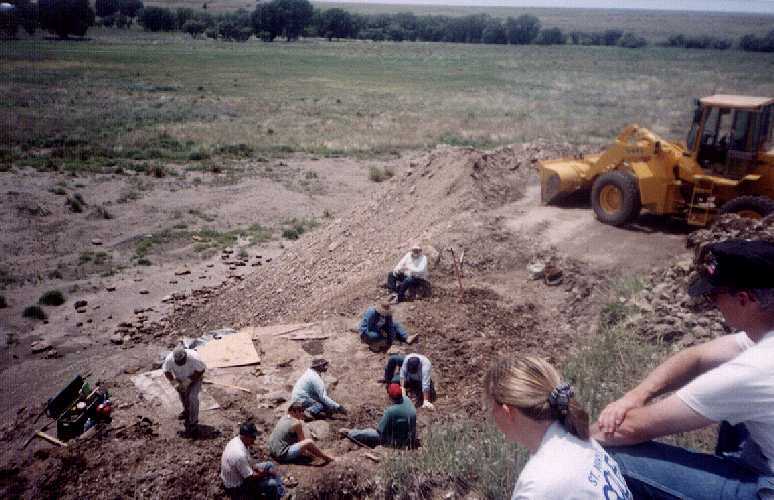 Several of the people in cars parked along side the road and walked in about 200 yards to the dig site while Glenn and I drove our vehicles across the prairie and parked on the flat ground above the excavation. The first thing we noted was that there had been a pretty good rain on the site. Fortunately, they had put a tarp down to protect the fossil the previous evening. Even so, quite a lot of water (and mud) had accumulated around the remains. We pulled off the tarp, then began draining puddles and cleaning up the mud flows. Nothing was harmed, but the crew endured less than the best working conditions until later in the afternoon when things began to dry out. Glenn gave the new crew members a quick summary of where bones were exposed, and I provided the background for the location of the caudal vertebrae and pelvic material that had already been removed. 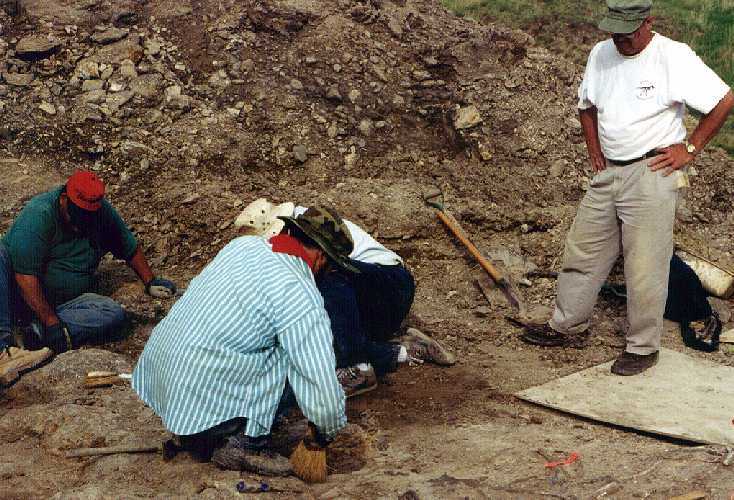 Then the real work started and we began clearing shale from areas that were above the bone layer. 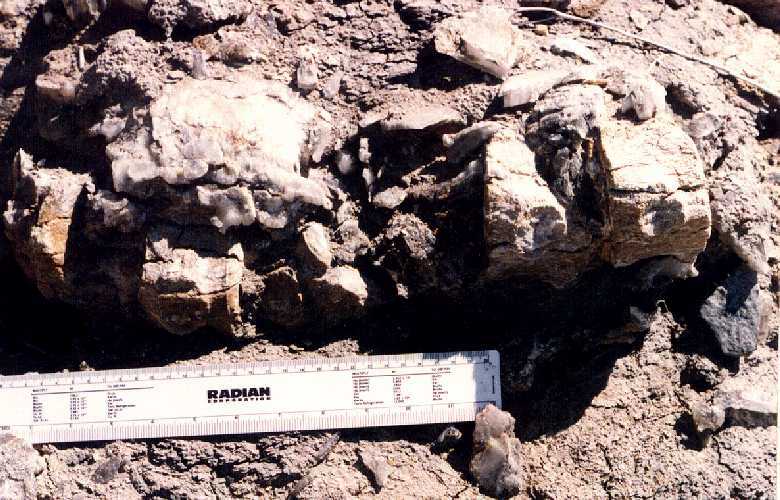 A few more bones were found but mostly the remains were clustered together along the axis of the eastern group of concretions. Here are four of Fred's professional photographs of the dig (and me, for a change). They are slightly larger (100kb) than other photos on this page and will take longer to load. Copyright © 1999 by Fred Solis. Things were more than just a little muddy after we pulled the tarp off Thursday morning. 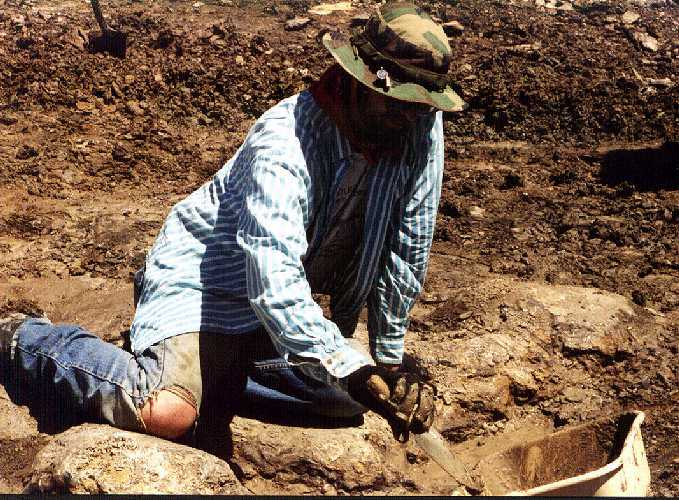 Here Glenn Storrs gets down to the dirty job of cleaning mud off the the exposed bones. This picture of dorsal ribs and gastralia shows what got wet and what didn't. Who said field work isn't glamorous? Glenn certainly seems to be enjoying the mud. Hmmmmmm......... looks just like a famous scene from "Jurassic Park". 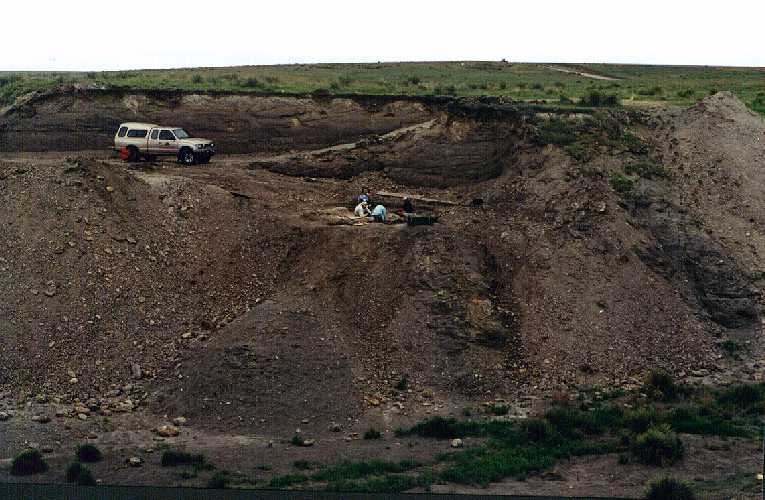 This picture was taken while I was standing on the last concretion in the main (east) series, looking southward toward original concretion #1 that contained the caudal vertebrae. Four years older now than when she discovered the plesiosaur, Katie and her dad watch as the crew cleans up the working area after the rain. 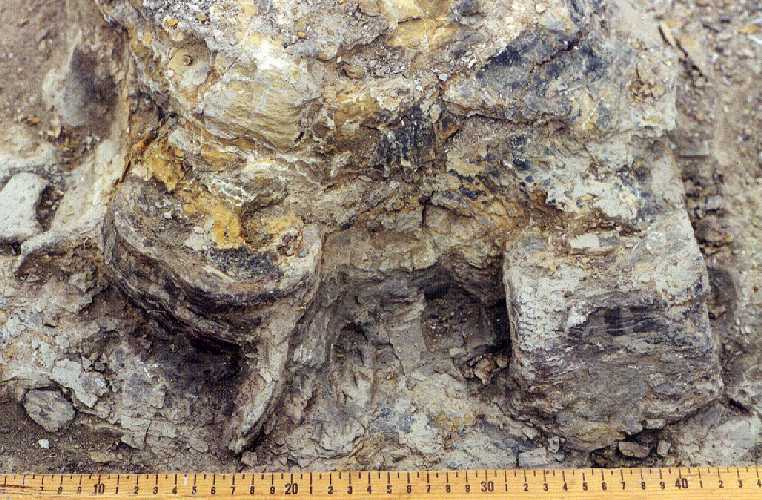 Mud and wet shale are puddled around two of the cervical vertebrae found near the middle of the east line of concretions. A good view of the dig site from the bottom of the gully to the south. 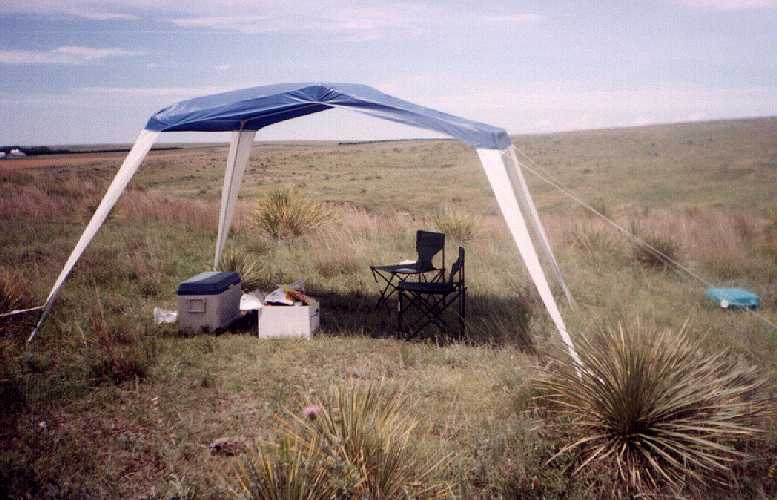 We had set a up an awning on top of the hill to provide a little shade. It was a nice idea, but the wind came up about noon and threatened to blow the little tent across the State line into Colorado. Day 5 (Friday) Fred Solis wanted to take some early morning pictures of the site, so I drove him and his daughter, Erin, to the site about 7:30 AM. We were concerned that there were too many clouds for good pictures when we left the motel, but as we went further west, the sun broke through and we figured that he get the conditions he wanted for the shoot. When we walked into the site, however, we found that we had not planned on part of the hill being between us and the sun. We uncovered the site and Fred took some other shots while we waited for the sun to creep over the hill. With our mission completed, we went back into town for breakfast. Expecting to meet the rest of the crew coming into the site, we did not leave a note to explain why the remains had been uncovered. It did create an interesting mystery for them until we returned to admit our guilt. We got back to the site later that morning and found a place on the ground to continue with our share of the digging. Bored with this activity, Pam went off around the next hill on her own search for fossils. A little later, someone noticed that she was waving to get my attention from about a hundred yards away. This usually means shes found something new and wants me to come see it. I was ready for a break and to stretch my cramped legs for a while, so I grabbed my tools and slid down the hill. When I got closer to Pam, I found out that she had slipped on some loose shale, fallen and twisted her ankle. Barely able to hobble on one leg, she managed to get back to a spot where she could be seen from the dig. I went back to our van and drove it around to where she could get in. While she could deal with the pain, she was obviously not going to be doing much moving around. We got her comfortable in the van and I went back to the dig. The landowners (Phil and his wife, Debbie) arrived at the site a little later to check on progress. 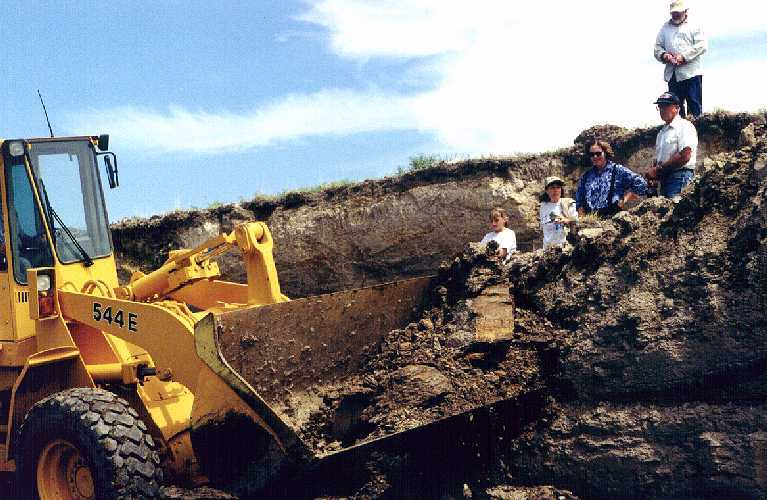 Things had dried up enough that Phil thought he could take off another layer of the shale, so he fired up the front loader and we all took a break to watch. He was able to cut off some of the material, but there were some soft spots that were still too wet for him to drive over. 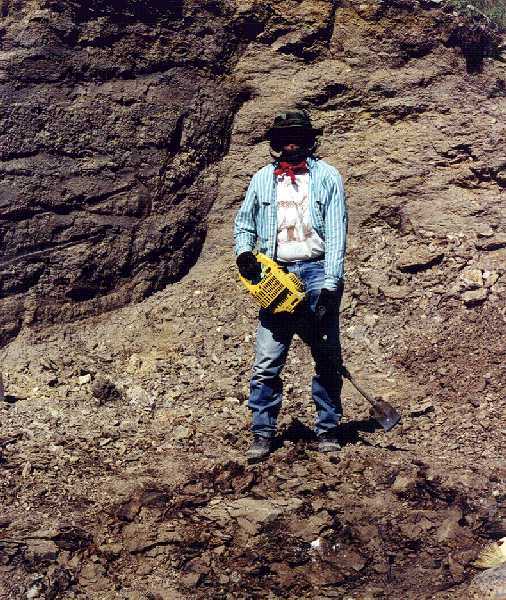 After he finished, we broke out the portable jack hammer and took turns cutting through the shale on the north side of the fossil, one layer at a time. We were really hoping to find signs of the neck and head of the animal in this area, but it turned out to be virtually empty of bones. The rest of the day was spent cleaning and localizing the remains that we had found. It was pretty hot and humid that afternoon, and everyone was more than ready to leave the site by 6:00 PM. The shale eventually dried out and we resumed cleaning up with brushes. 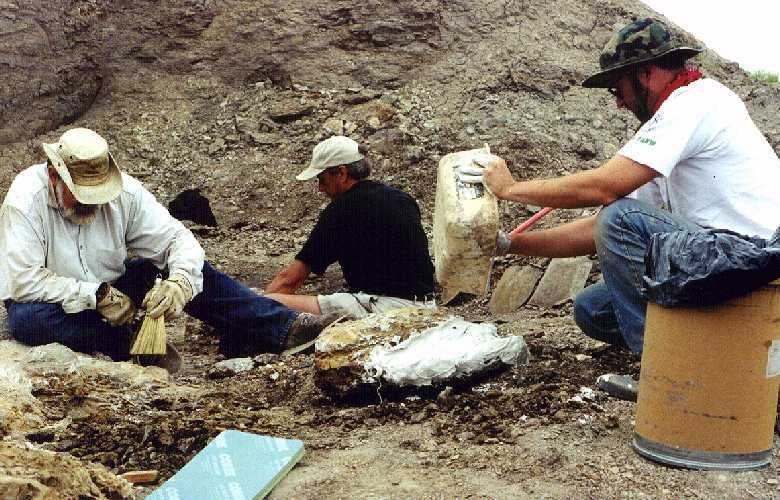 Here Richard Swigart watches as Glenn examines a bone near the center of the specimen. Phil Collins came by again and helped the cause by removing another couple of feet of shale off the north side of the dig. While most of the detailed work had to be done with small tools and brushes, it was really nice to have some heavy equipment around to get us down to the working level. Thank you, Phil!! 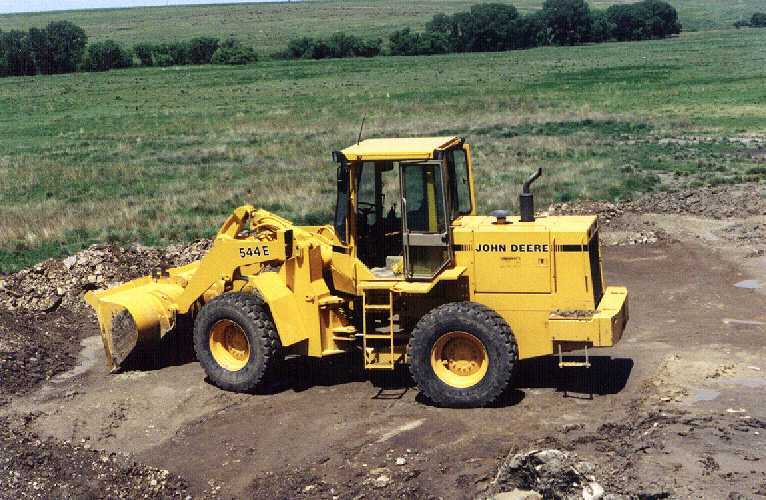 "Nothing runs like a Deere, John Deere, that is." From left to right, Katie, her mother, Debbie Collins, Pete Bussen and Jim Clark watch as Phil Collins moves another bucket load of shale. Richard Swigart (with shovel), Katie's dad, and Glenn Storrs watch the high loader from the other side as it removes part of the hill. 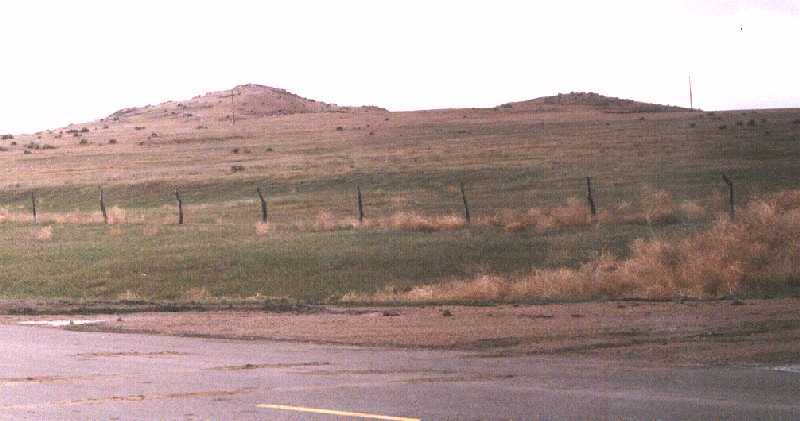 A view of the dig with a little less shale on top. At this point, the ground was still too wet to go further. Catching the photographer at work. Fred Solis is taking a picture of Glenn Storrs doing some serious work with the portable jack hammer while Jim Clark makes an effort to get out of the picture. See Fred's story here. The ribs were piled together without any apparent order. 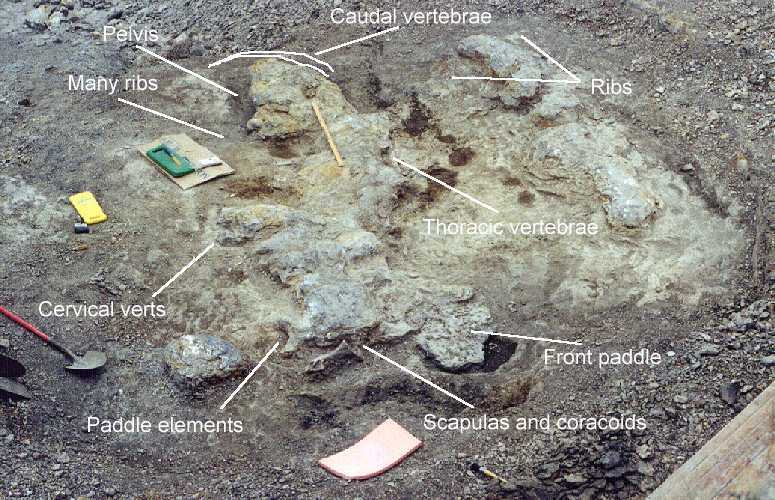 With five pieces to each set of ribs, a plesiosaur dig can encounter a lot of rib bones! Caution! Man with power tool! The portable jack hammer was a real labor saver on this dig, allowing us to quickly cut through 6 to 10 inches of shale at a time. Richard Swigart and Jim Clarke prepare to clean up the site at the end of the day. Glenn kept telling us that "A clean dig is a happy dig" as we shoveled and swept away the debris of the day before covering the remains for the night. Feel the heat!! This picture was taken late in the afternoon on Friday, looking toward the northeast. The temperature was about 95 degrees (F), there was no wind, and we were sweating buckets! Day 6 (Saturday) At the restaurant, we met another volunteer (Steve Johnson) and another photo-journalist (Ron Williams), both of whom are from Kansas. There were no clouds in the sky when we arrived on the site and it was pretty apparent that it was going to be a typical Kansas summer day. The worst part about it was that there was no wind blowing and the heat was pretty oppressive. Although the wind did pick up a bit later in the afternoon, we were pretty well steamed by the time we covered the dig that evening. Ron Williams did his thing, filming the dig site and interviewing the crew through the morning hours. 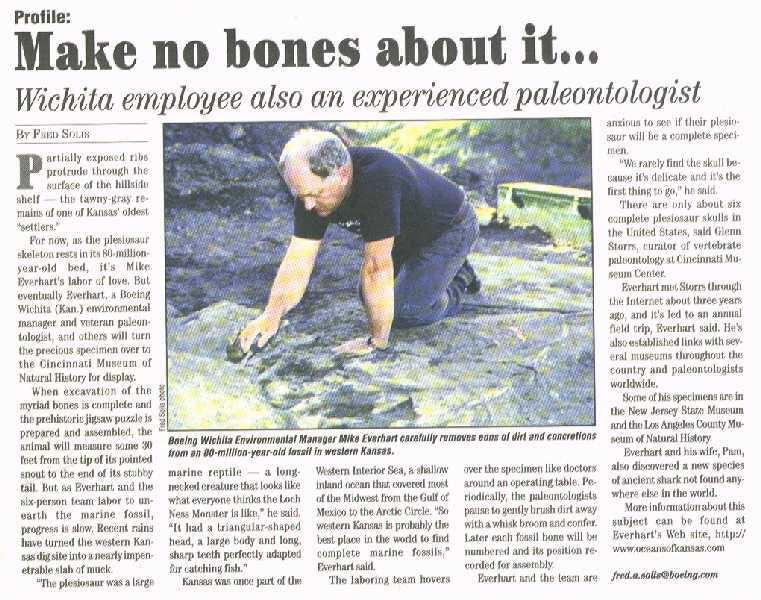 My first job on the site that morning was to explore along the edge of the concretion that had been nearest to the half pelvis that we had found in 1995. 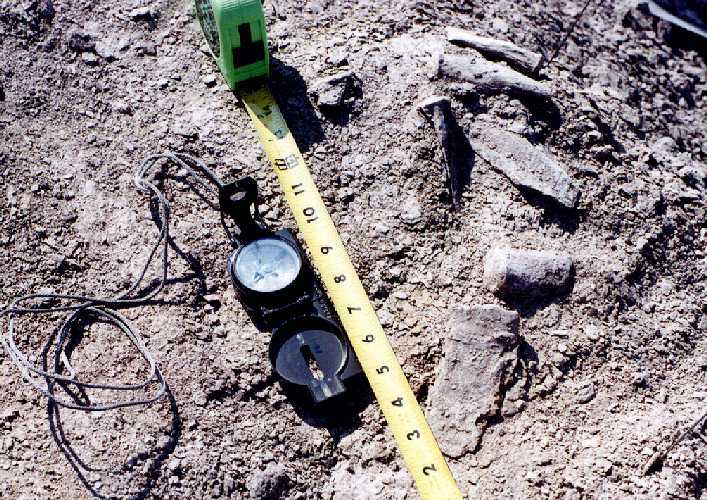 These paired bones are large and heavy, and it is not likely that they would be found widely separated. I dug around and under the concretion without finding anything and began to wonder what had happened to scatter the remains of this animal so completely. Later that afternoon, Glenn walked by where I had been working and asked "Whats this?" as he pointed to a large piece of exposed piece of bone. 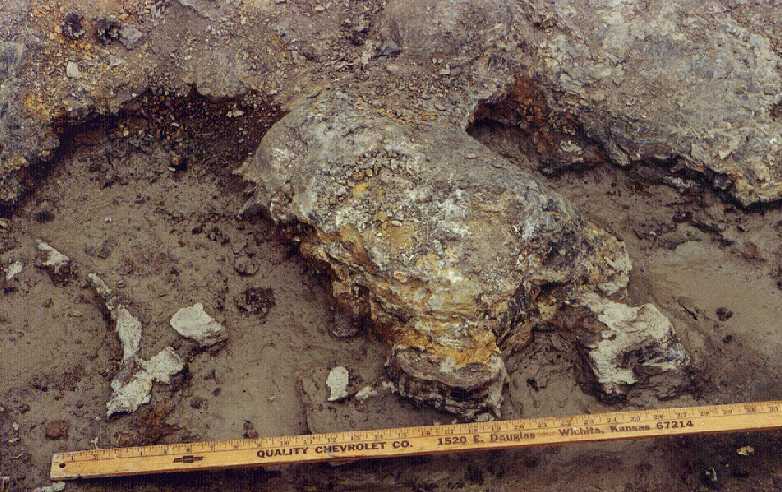 Sure enough, I had found the other half of the pelvis that morning and had not been able to see it against the similar color and texture of the concretion around it. Embarrassing as it was for me, I was glad that the piece was where it was supposed to be. I can always claim it was the change in the lighting that made it more visible. We broke for lunch with the consensus that we had exposed most of the bones that were there and that it was time to document the locations and start picking them up for packing. 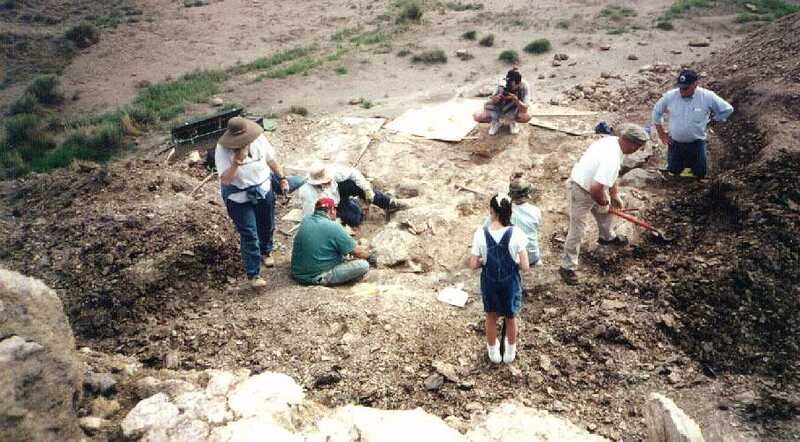 That afternoon, we rolled out sheets of plastic over the remains and used magic markers to show where the bones and concretions were located. 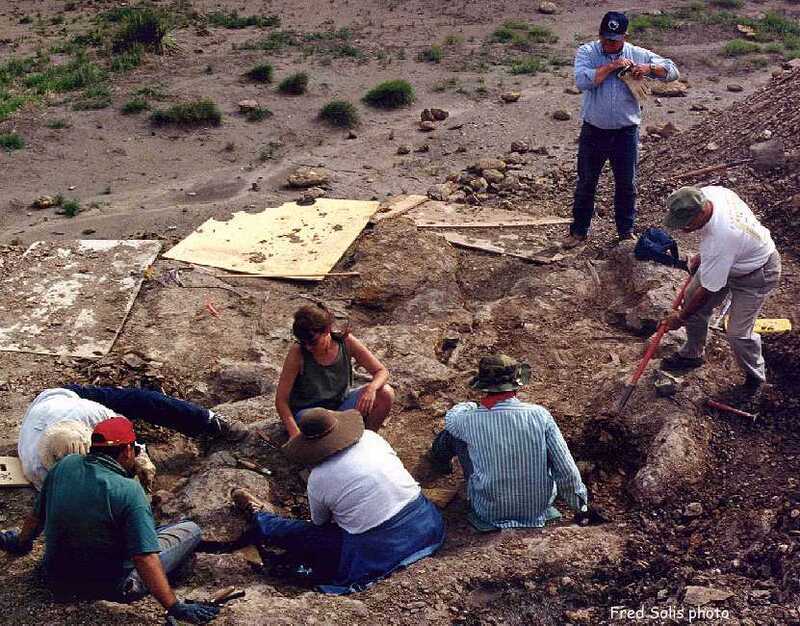 This created a permanent record for the dig and, in addition to the pictures and drawings that had already been done, helps to document the locations and spatial relationships between the various bones. Once we had everything marked on the plastic, we began to take the bones up one at a time, assigning a number to each was we moved through the site. The bones were wrapped in aluminum foil and packed away for their journey back to Cincinnati. 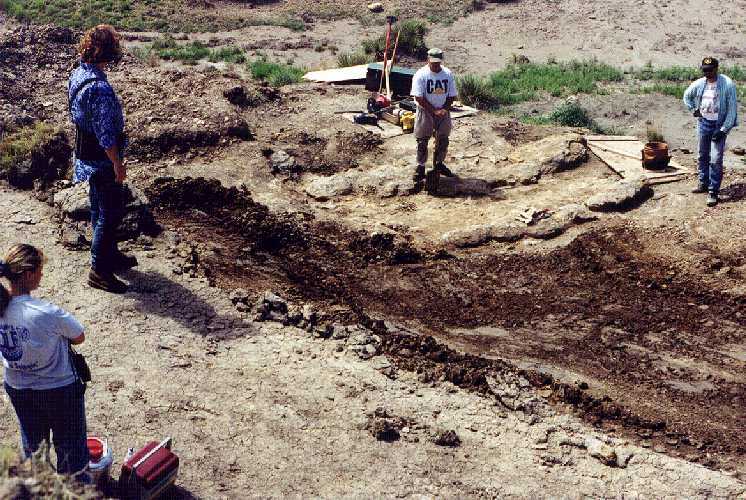 By the end of another long day (7:00 PM), we had the site pretty much cleared of the smaller ribs and limb elements, and Glenn had begun to apply plaster jackets to the concretions where bone was exposed. Find the bone......... 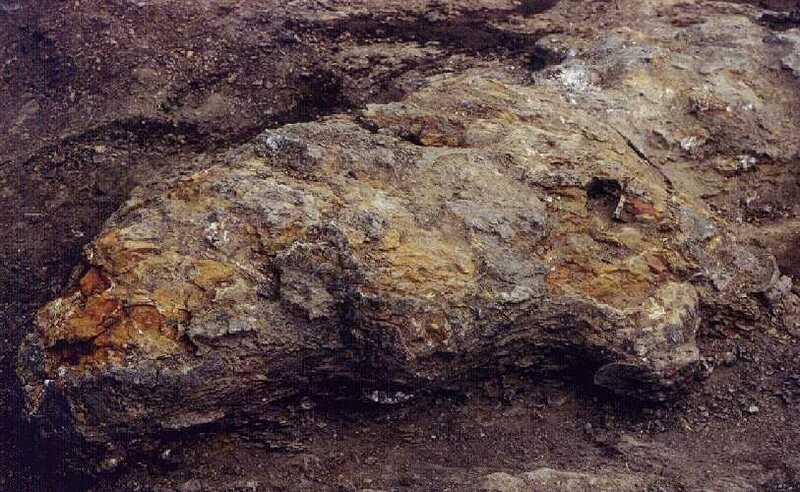 This is a picture of the east side of the #1 concretion. I had spent thirty minutes clearing the shale away from the concretion in an attempt to find the other half of the pelvis. 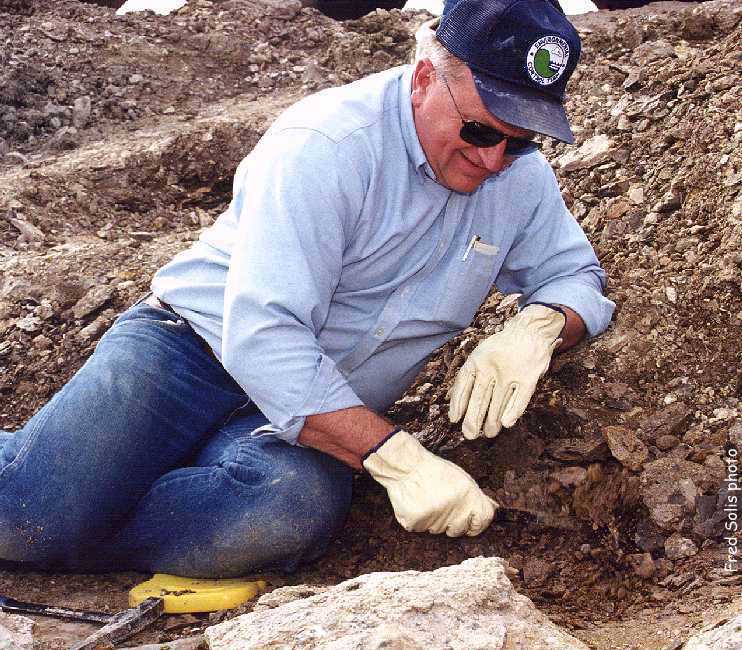 Steve Johnson digging shale in the area where we anticipated finding the head and the rest of the neck. We came up empty in our search and hoped that it was somehow included in the concretions that contained most of the rest of the animal's skeleton. Still looking but not finding. Plesiosaur skulls tend to be very rare in the fossil record, in part because of their relatively small size and light construction. The two bones under the meter stick are probably the scapulas that help support the front limbs. A good picture of two of the cervical vertebrae laying near the middle of the specimen. The one on the left is sitting on its end, while the one one the right is laying on its side. Back to concretion #1... now you can see the bone, can't you? Glenn Storrs found it late in the afternoon after I had missed seeing it that morning ........... (its the lump coming out on the right hand side of the picture. Day 7 (Sunday) This was to be Pams and my last day on the dig since I had to return to work on Monday. The field crew had dwindled to Glenn, Jim, Richard, Steve and myself, and I felt bad about leaving without finishing the dig. 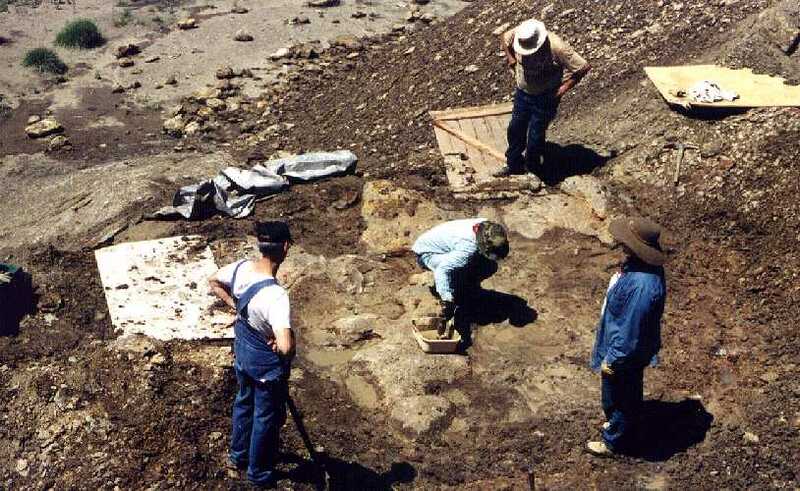 To make matters worse, Richard and Steve were also leaving and the bulk of the heavy work of removing the concretions the following week would fall to Glenn and Jim. The day was really nice with a breeze, heavy clouds and temperatures in the low 60s. 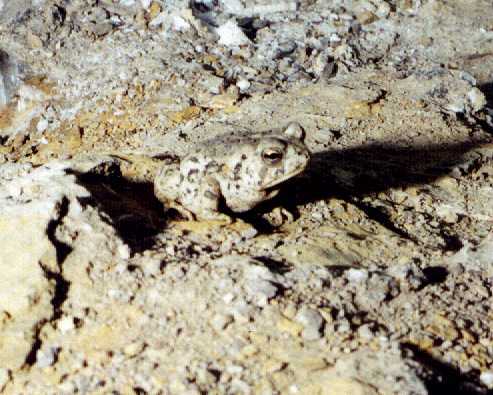 When we removed the tarp, we found that Tony, the Night Watch-Toad (Bufo woodhousii) was still there and on the job. I never figured out where he went during the hot, day-time hours, but he was always on the job when we got to the site in the morning. 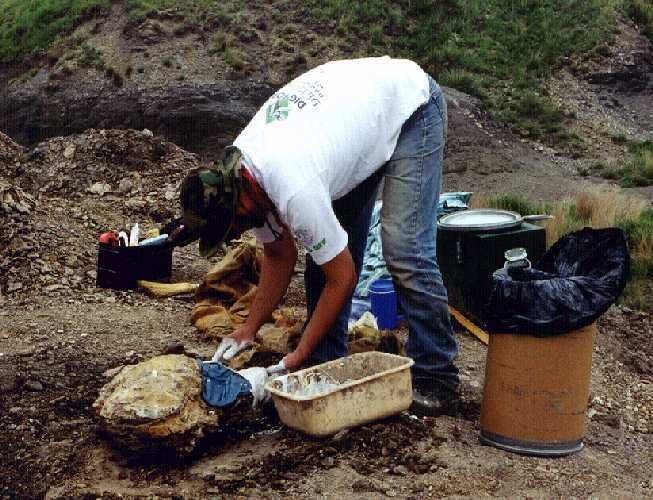 We worked as quickly as we could to free up the concretions and to locate any additional bones that were resting beside them. Just before noon, I started taking notes on the stratigraphy of the site (jobs not done until the paperwork is finished). 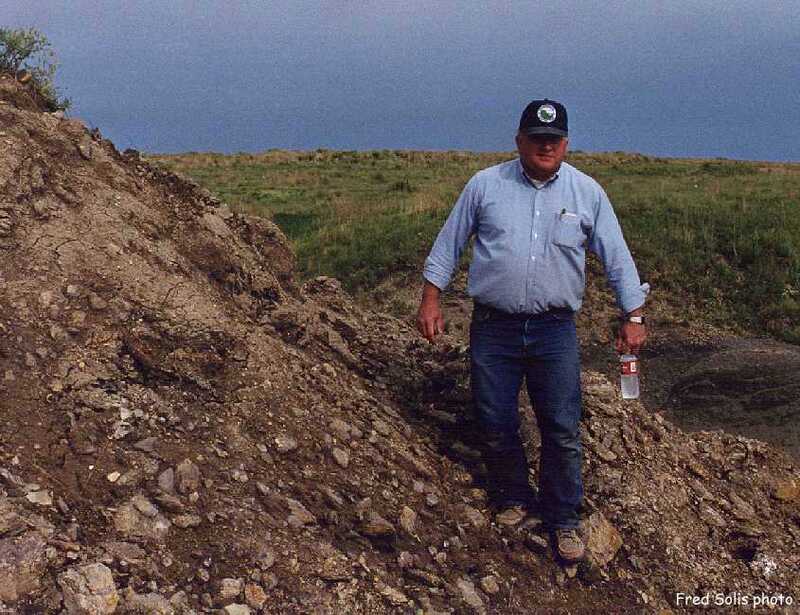 The find was conveniently located between a couple of bentonite layers, near the top of the Sharon Springs member. 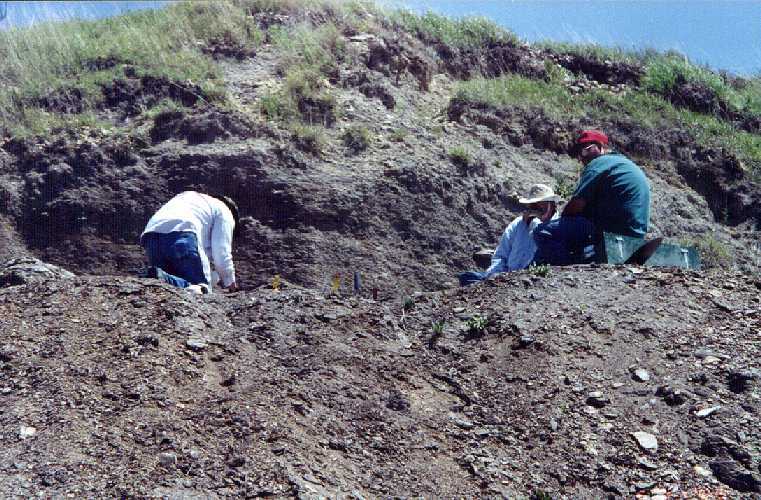 We would be able to measure downward from the contact with the overlying Weskan member and have good documentation on the stratigraphic location (and age) of the plesiosaur. We had lunch and wrapped up our part of the dig about 2:00 PM, and got on the road for the 5 hour trip back home. Looking to the south at the dig site after all of the smaller bones had been removed and packed away. The labels on the picture indicate the general locations of various parts of the plesiosaur. The stratigraphy of the site looking north from the bottom of the gully. The surface was defined by large septarian concretions and there were prominent bentonites about 3 meters above and below the specimen. 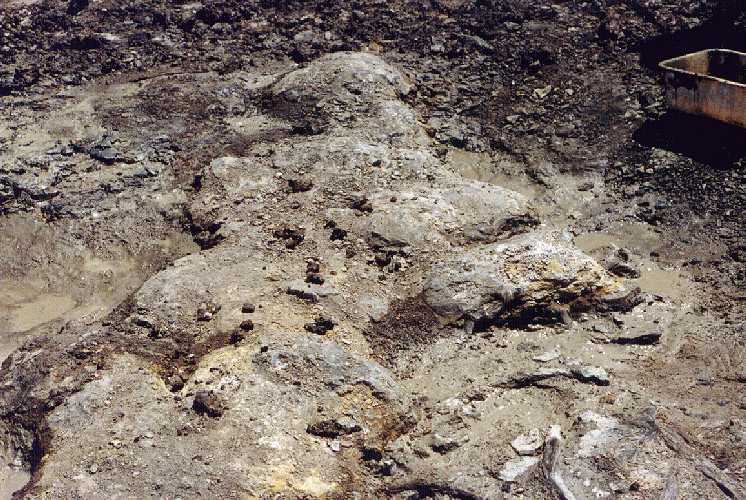 The specimen was found about 10 meters below the contact of the Sharon Springs member with the Weskan member of the Pierre Shale (late Campanian, Zone of Baculites mclearni, approximately 80 mya). Another view, looking north at the dig site as it appeared on Sunday, June 27, showing the extent of the overburden that had to be removed. A wench was used to pull the jacketed concretions up the slope to the truck. 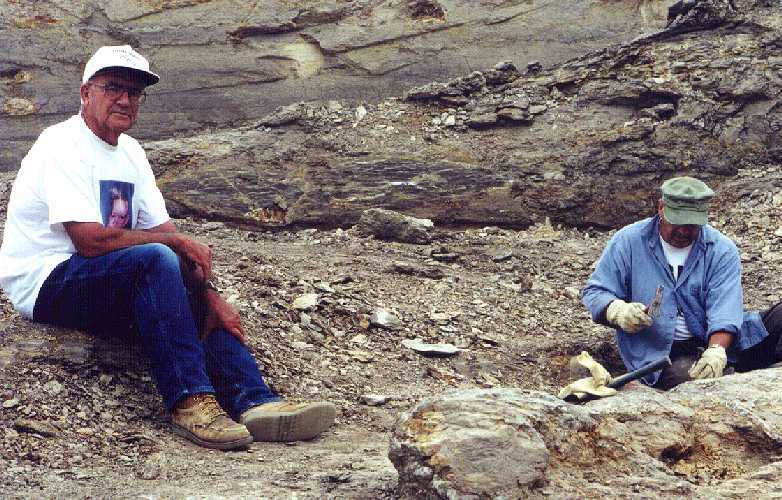 Pete Bussen shares a few stories as Richard Swigart clears the shale from the concretion containing most of the shoulder bones of the plesiosaur. Glenn gets plastered! Although the concretions were very solid, they were given partial jackets of burlap and plaster to protect the exposed bones that were inside. 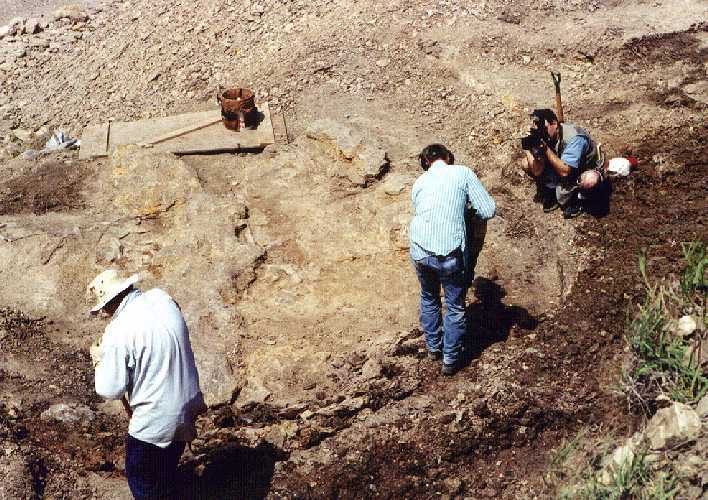 Preparation of the remains will be more difficult than usual for the Pierre Shale because the concretion is harder than the bone. Enclosing a fossil in a protective jacket of plaster and burlap is a process that probably dates back to the days of Cope and Marsh. 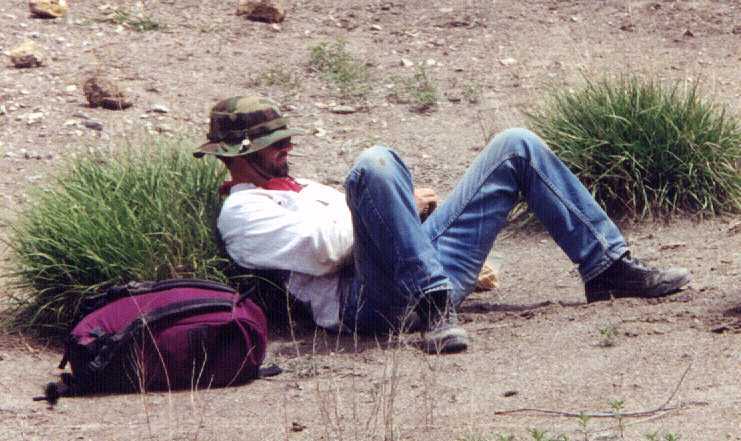 While other methods have been tried, plaster jackets are still regarded as the most practical in the field by most paleontologists. "Okay, guys, now pay attention..... this will be on the test," says Glenn while Jim Clark and Steve Johnson stay focused on other duties. 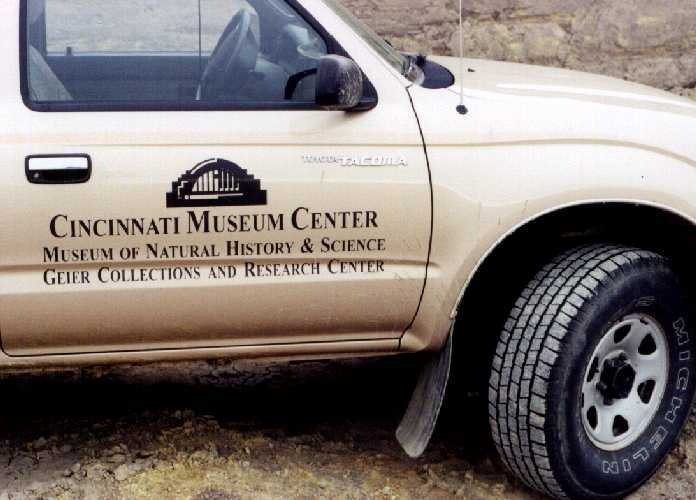 Just a little advertisement for the Cincinnati Museum of Natural History. It has been a real pleasure to work with Glenn Storrs and his crew the last couple of years. 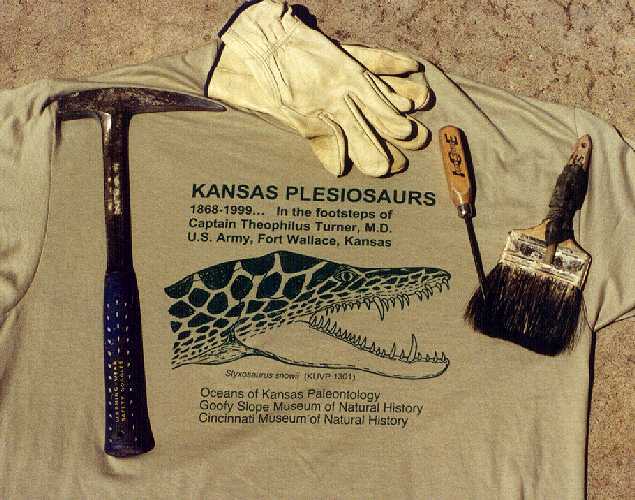 A big Kansas thank you to the volunteers who came all the way from Cincinnati, and to the Oceans of Kansas crew (Angie, Richard and Steve), who helped with the dig. "Hey, put that camera down!" says Mike, "I'm supposed to be the one taking pictures on this dig!" Too late, but the photo does show our nifty and very official Cincy-99 Dig T-shirt. A list of references in my library about mosasaurs and plesiosaurs. Credits: The drawing of the plesiosaur at the top of the page was adapted from Kansas Geology, Rex C. Buchanan, Editor, University Press of Kansas, 1984 and is used with permission of Rex C. Buchanan. The background image is from a photo of the mounted specimen of Thalassomedon haningtoni at the Denver Museum of Natural History, Copyright © 1999 by Mike Everhart.